Thomas awoke in a ditch around 7 a.m. with the sun bearing down on his face, ready for breakfast. He was already sunburnt. From his position near the eastern edge of the woods, he knew he must be around 1,000 feet from home and, judging by the condition of his clothes, he assumed he probably had a good time last night. Of course, he didn’t really know. He couldn’t remember. Last night, Thomas wrongly assumed his friends were “with him,” matching him drink-for-drink. After all, that’s how they did it in college. Because he was drunk, Thomas did not notice his friends exchanging concerned glances throughout the evening. He also didn’t realize he had been the only one “partying” every night of the week. Maybe you have a friend like Thomas. A friend whose drinking has begun taking over their life–but you’re just not sure what you can do about it. Ultimately, your friend will need to make the decision to change, but there are ways to help them out of this cycle of alcohol abuse. Helping starts with recognition, and then deciding on an approach. There is no single way to determine whether a friend has a drug or alcohol problem. Every individual is different, and just matching one criterion listed below is probably not cause for concern, but if several of the conditions below are met, then it could be time to address this problem with your friend. A social life which revolves around drinking –Your friend’s primary mode of socialization includes alcohol. They continually and repeatedly insist that your social gatherings take place at bars, or they regularly bring their own alcohol when hanging out. Your friend is increasingly late or absent – For some people, being late is normal. Some people are late to work, late to meetings, late for dinner; sometimes people are just late. But your friend’s behavior has changed–absences from work or a nonchalance towards scheduling are now the norm. Your friend puts him/herself in risky situations – Drunk driving is a classic example of risky drinking behavior, but this can also include being “falling down drunk” as well as being in positions where your friend either endangers himself or others in public. 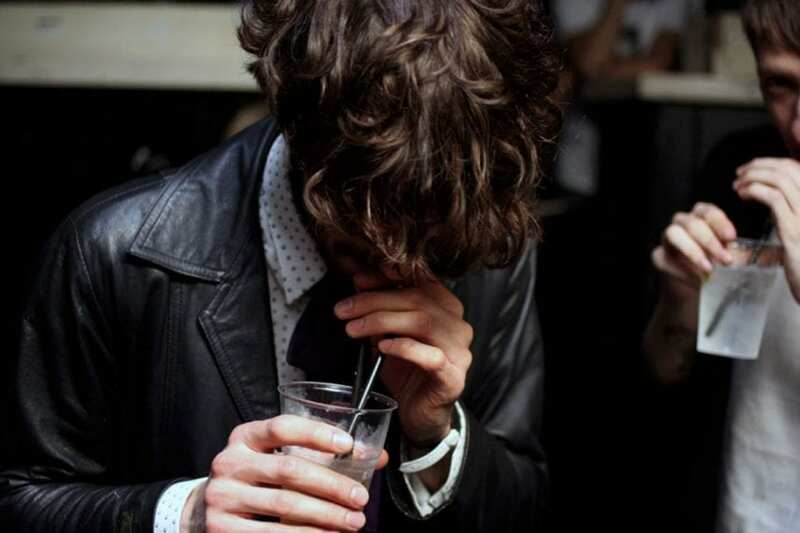 Memory loss (blacking out) is common – Your friend regularly can’t remember what happened the night before–they blacked out (they don’t have to have ‘passed out’ to experience this). Blacking out is a memory gap caused by alcohol, which is not just irresponsible, but dangerous for any number of reasons. It is also immediately dangerous to one’s health to drink to that point, and a pattern of blacking out has been linked to the death of brain cells and shrinkage of neural pathways. Your friend vows to quit drinking, but doesn’t – Whether it is because of a nasty hangover, a fight, an unpleasant experience or embarrassment, your friend might have vowed to stop drinking. “I’ll never drink again!” they might say. Yet a pattern of repeatedly unpleasant experiences continues, in spite of assurances to the contrary. Your friend becomes a ‘different person’ when drinking – Dramatic personality shifts occur in your friend after drinking–on a regular basis. Alcohol is commonly used to mask depression, anxiety and stress, so their increased drinking may be an attempt to hide from these emotions. Many of the problems listed above directly stem from the actual effects of alcohol, so it is not worthwhile (and can even be self-defeating) to try and address these problems while your friend is under the influence. There is a time and place for trying to help, and there are great ways to broach the subject of their alcoholism. Time your message right after a problem it’s caused – If you talk to your friend shortly after they’ve dealt with a problem caused by their drinking, whether it’s an arrest, hangover, or just embarrassment, then your message has a better chance of making an impact. Avoid addressing your friend while they’re intoxicated – It is strongly advised not to approach your friend while they are under the influence, because no matter how carefully you craft your message, and how well it is delivered, if the person is drunk, there is a chance your concerns could be misconstrued, interpreted as an attack, and possibly dismissed. Focus on specific effects of their drinking – Concentrating specifically on the consequences of a friend’s drinking has a dual effect–addressing the problem head-on, and preventing them from changing the subject. Compassion is especially important when discussing consequences, so remember to use expressions like, “It really hurts me to see you go through all of this.” By focusing only on the consequences of their drinking, you are addressing a problem that affects both of you, rather than trying to restrict their behavior. Avoid lectures – Resist the urge to condemn certain behaviors, and avoid giving what might sound like an authoritative lecture. Some believe a strong confrontation in which one person “puts their foot down” is effective, but this is shown to lead to denial and resistance in the friend you want to help. You do not want to use terms like ‘alcoholic’ or ‘abuser’ because these can be just as polarizing. As a friend, you have a unique opportunity to express your concerns in a way even family members cannot. If they are open to suggestion, encourage your friend to see a professional. Keep the talk conversational – Just because you are outside both your comfort zones does not mean this discussion has to sound like a formal intervention. Instead, let your natural rapport suffuse the conversation. Your friend needs to hear from the real you. Go into the conversation with realistic expectations – Anger, denial, and alienation are among the strongest reactions you could face from your friend. Do not take it personally, because these are common reactions. The talk could disintegrate on the spot, or the person could receive your message and continue drinking. Regardless, do not expect immediate results. Your message, and the love and concern behind it, will still be there. In some cases you might only be planting the seeds of change. But they will remember. Offer assistance finding help – If your friend is ready to receive help, you should have some ideas ready for how to help them. Support groups like Alcoholics Anonymous have shown great results, and a treatment center like Alta Mira will personalize recovery to your friend’s needs. Drinking has not destroyed your friend. Maybe they are a different person while drinking, but the person you know and love is still there. People fall into alcoholism for many different reasons, but all you need to worry about is being a good friend and offering them the help they need to climb back out. If your friend expresses a desire to seek treatment, guide them towards help. A world-class treatment center like Alta Mira will work with your friend to determine the cause of their drinking, avoid relapse, and develop the best treatment plan for their individual needs. Approaching a friend with a problem can be extremely difficult, but if you care about your friend, and you are in a position to help, then it is definitely worth the effort. If you would like to talk with professionals about a friend’s addiction, reach out to us today. We are here to listen to your story, and help those suffering from addiction towards healthier lives.